The Art of Madness Available Now! Alter the flow of time? Check. Pay the bills on time...? Phoenix McGee became a detective to show the world he was mature, reliable, capable of running his own life and business. It’s just a shame he can’t adult his way out of a paper bag. On the verge of losing everything, he takes on a simple case of suspected adultery, something to keep the lights on and the creditors at bay. Little did he suspect his life would become a chaotic whirlwind of false leads, uneasy alliances, mob ties, and a woman who punches with a sedan. Bodies pile up as he struggles to keep things normal for himself and his assistant, Suzette DiMarco. In Rouge Mal, Nevada, unusual is normal. Being a haven for the supernatural and superpowered, it’s common to see a vampire on the street while a psychic informs you your bus will be late. Just present your Black Card for proof of powers. That’s not to say there are no normal people, far from it. Then there is Phoenix McGee, the GearWitch. 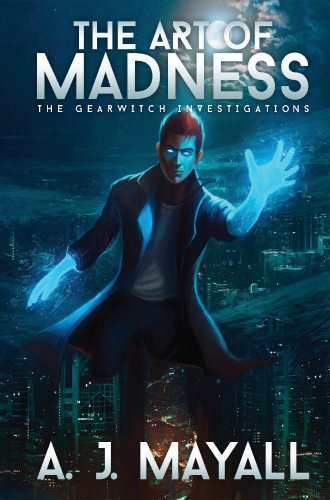 Being attuned to the clockwork nature of the universe and able to bend the fundamental laws of reality comes with the bonus that his powers show up under no scans, leaving him in a loophole where he can use his powers without legal restriction…or protection. ...because cosmic powers don’t pay the bills. This is the official website of author AJ Mayall. Keep an eye on this page for news and updates on upcoming books and appearances.